Multiple scenes of Sherman County, Kansas. The switch engine crew photograph includes left to right: Jeff Powers, Engineer, George Claycomb, Fireman, Nim Soden, Switchman, Lester Neal, Yard Clerk, unknown, Ray Bolen, Switchman. 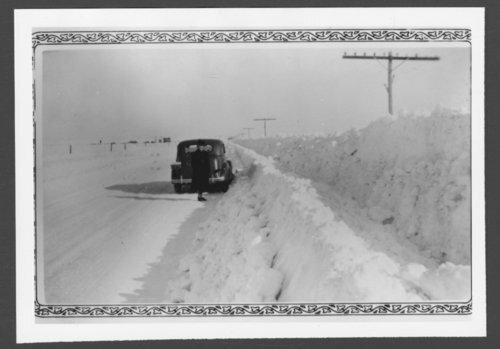 Scenes of Sherman County, Kansas - A snow scene between Goodland and Ruleton, 1948.